Making My 4th Doctor Costume: Vrooop! Vrooop! Vrooop! Wednesday this week I had a fun afternoon in London for a change. It kicked off with a trip to some bootmakers for my Matt Smith series six boot fitting, after which I headed to the West End. The reason for going was to visit the Cartoon Museum on Little Russell Street, hidden away in the backstreets of Bloomsbury. 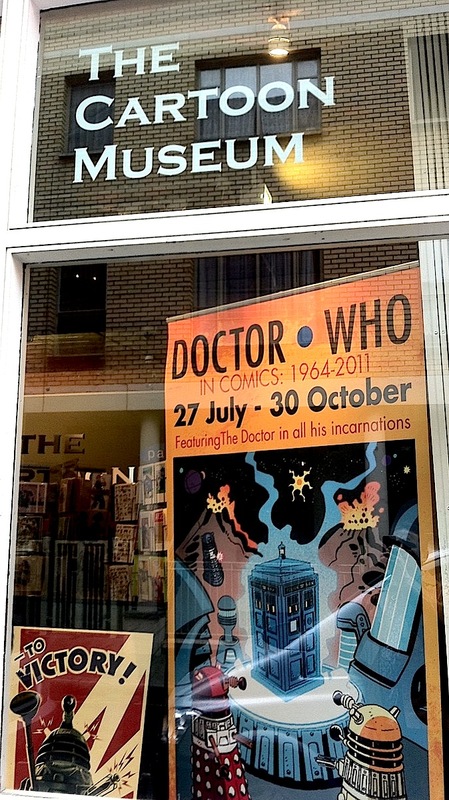 They currently have a fantastic exhibition of Doctor Who comic strips through the years, dating right back to its beginnings and coming bang up to date with the current generation of artists. 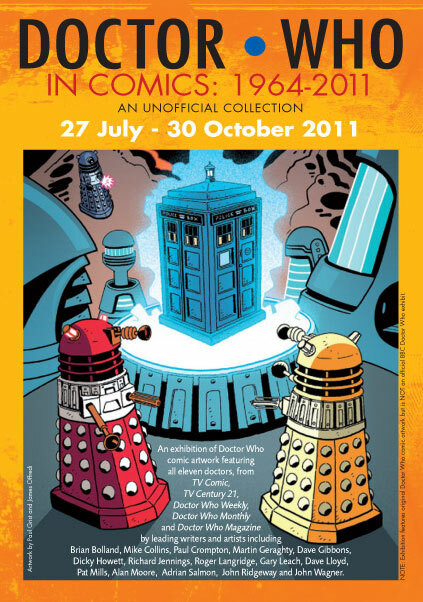 The exhibition showcases works by the cream of British comic book artists, such as Frank Bellamy, Martin Geraghty, Dave Gibbons, Dave Lloyd, John Ridgway, Andrew Skilleter and Lee Sullivan. However, my personal favourite piece was an uncredited artwork (see below) done for a annual exclusive to Marks and Spencer! For me it just fires up memories of the Dalek annuals I read as a small boy, and the Dalek Death Ray ice lollies I would buy from the Toni Bell ice cream man who would frequent the cul-de-sac I grew up in in the 1970s. The exhibition overall is seriously well worth a visit. But this evening there is the first of three talks being given on the history of Doctor Who comic strips. 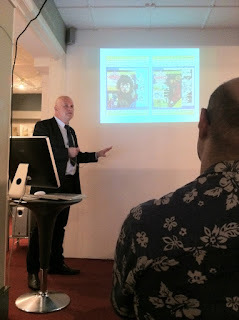 Tonight's talk was by none other than Dez Skin, who initiated and was the first editor of the then Doctor Who Weekly, which after 44 issues became Doctor Who Monthly, a title still running today. It was a very informal talk and Dez was very engaging with the small intimate audience present. Don't get me wrong, it wasn't that hardly anyone turned up - quite the contrary - the museum is very small and ticket numbers were strictly limited. Somehow that made it all the more fun. It was like one of the early Doctor Who local group meetings from years ago, before the US style influenced conventions started springing up, which can be a bit sterile. Anyway, Dez told us the tale of how he approached the BBC in the mid 1970s to do a weekly comic, but wast let that due to a Dalek strip still running in another comic called TV Action, no-one else could have the license. End of. 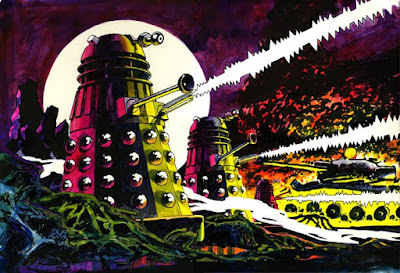 Dez explained that Doctor Who in comics in the mid 70s was not a good time. 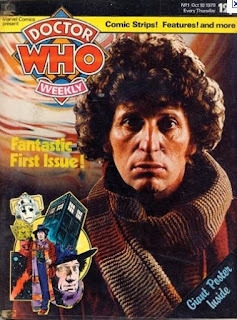 It was often relegated to low billing, and he showed some issue covers where Tom & Jerry were splashed across the front, and Doctor Who was a footnote - also inside. 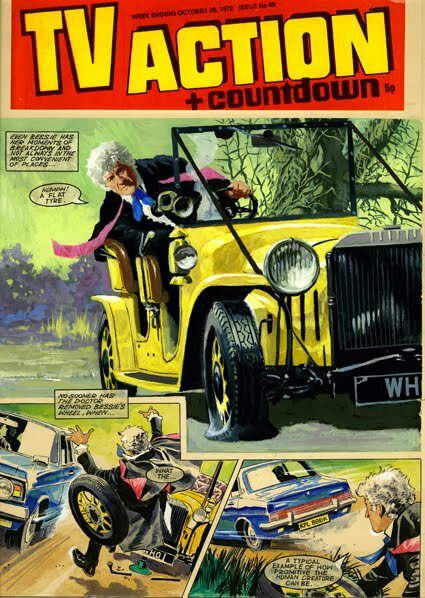 He also talked of how there was little love for it from the publishers side, and rather than commission new strips they would publish old ones from Jon Pertwee’s time and paste Tom Baker’s face over the top! So Dez bided his time and when TV Action comic finally folded, he planned a second pitch. This time round he prepared a dummy first issue, with mocked up pages. Not wanting to blow an editorial budget on a pitch, many of the illustrations were from other comics, and he showed us how the Mekon from Dan Dare put in an appearance, as well as The Incredible Hulk!!!! There was some complicated coincidences around the same time, ending up with Dez appearing in a BBC documentary the day before his pitch. In it he came across as a hard-nosed businessman, so when he did arrive for his meeting the bosses at BBC Enterprises said yes to everything, almost as if they were scared of him! 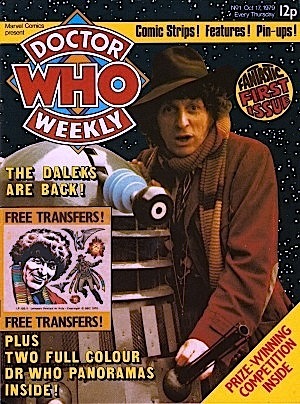 So in October 1979 a dedicated Doctor Who magazine first hit the news-stands on a weekly basis. I can remember buying it when it came out. There wasn’t much around in those days - beyond the annuals - and to be honest I was more interested in the photographs published than the comic strips, but I enjoyed the whole weekly fix as it can available. Much of the rest of the discussion centred on the state of the print publishing industry at large, and how no-one takes chances on new publications the way they did before. This is due to lot of the publishing houses being owned by venture capital companies rather than entrepreneurs like marvel’s Stan Lee. Once we had collective put the comic book world to rights, we were over time and the seminar was over. Once last surprise was in-store though. One member of the audience had brought along the official certificate from the Guinness Book Of World Records, which recognises Doctor Who M agazine as the longest running tv-tie in magazine. Before he left Dez posed for me, hold the certificate and the original dummy issue one of the magazine. I must say that Dez was a true gent, and a great guest. he was quite self-unoffacing and felt he was mumbling his way through, but we ALL enjoyed his irreverent style and story telling.